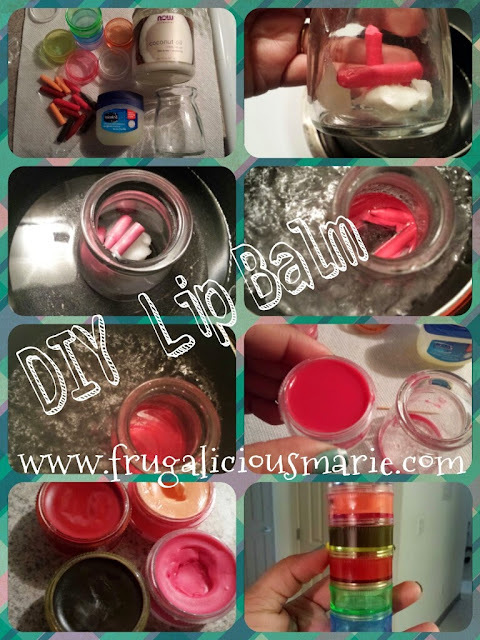 Who's heard about DIY Crayon Lip balm/lipstick? Here goes a tutorial on how to make your own! One whole crayon, preferably Crayola. I tried this with Target brand crayons and the result was too waxy. A mold of some kind for your lipstick. I used a pill case that I found at the dollar store (Dollar Tree). Place jar in boiling water, the crayons should begin melting. Place the case with the mixture in the refrigerator for about 15-20 minutes so it could harden before you use it. You’ll get the best results if you apply this lipstick with your finger, the heat from which will help soften up the wax for easier application. The lipstick is matte, meaning it doesn't have any shine, but if you swipe a lip gloss over the top, the shade will really pop. You can mix crayons to make your own custom colors. Be creative and have fun! This is a must do, especially with Halloween around the corner!